This is a delicious twist on the traditional jack-o’-lantern. These cakes makes a great addition to any Halloween party. You can also make a giant jack-o’-lantern! Follow the same steps, but use two full sized bundt cakes and use a green-frosted banana as the stem. Prepare cake mix according to the recipe on the back of the box. Grease and flour 8 mini bundt cake pans and arrange on a large cookie sheet. Divide the cake mix equally among the pans and bake at the temperature indicated on the cake box. When a toothpick inserted into the cakes comes out clean, remove the cakes and allow to cool (it took around 25 minute bake time at 350 degrees for ours). Once cooled, trim the bottoms of each cake with a serrated knife. In a large bowl, combine frosting with red and yellow food coloring until the desired shade of orange is attained (about 40 drops of each). 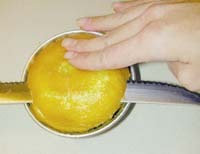 Once cooled, trim the bottoms of each cakes with a serrated knife. Remove the cakes from the pans. Spread a layer of frosting on the bottom of 4 of the cakes to serve as the “glue”. On each frosted bottom place another cake, bottom to bottom. You should now have 4 cakes resembling pumpkins. Cover cakes with remaining frosting. 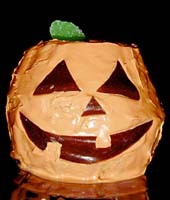 Using a sharp knife, cut out jack-o’-lantern features (eyes, noses, mouths) and arrange them on the cakes, pressing firmly into frosting. Insert a fruit wedge all the way into the hole on top of a cake (this serves as a base) and then another on top of it (this serves as the stem). Repeat with each cake. Arrange cakes on a dish surrounded by candy corns, if desired. Boo! This entry was posted on Wednesday, September 12th, 2007 at 12:43 pm	and is filed under Desserts, Holiday & Seasonal, Master Recipe Index, Vegetarian. You can follow any responses to this entry through the RSS 2.0 feed. You can leave a response, or trackback from your own site.